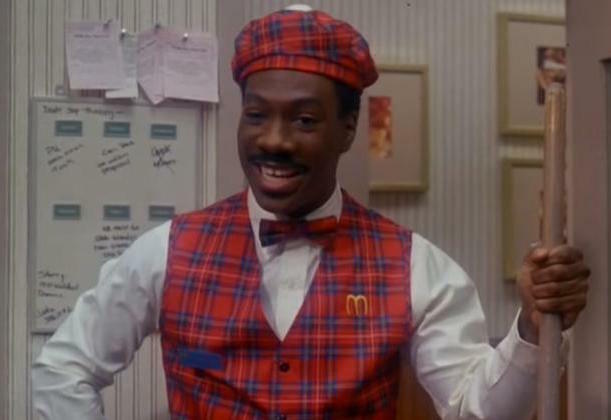 Back in 2017, we learned that John Landis' classic comedy Coming to America was officially getting a sequel. Today, more details have emerged, including the news that star Eddie Murphy will return. If you were worried that the movie would feature some new fresh-faced actors stepping into old roles, fret not — according to Deadline, Murphy has signed on for the film. He'll be joined by everyone else from the original cast, which includes Arsenio Hall, Shari Headley, John Amos, and James Earl Jones. The film's script was written by Barry Blaustein and David Sheffield, who also wrote the original film. It's currently being rewritten by Kenya Barris, and when it's ready to shoot the project will be directed by Hustle & Flow director Craig Brewer. A release date has not yet been revealed, but we're not sweating it too much. It's been more than 30 years since the original, so we can wait a little longer.